Lion's mane mushroom may help promote brain and nerve cell health, to help improve focus, clarity, memory, learning ability, and overall cognitive function. Lion's mane has also been shown to help support a healthy mood and stress response. TRADITIONAL BRAIN BOOSTER - Known as the "smart mushroom," lion's mane has been treasured throughout China and Japan as both a culinary delicacy as well as a tonic for enhancing mental alertness while maintaining a feeling of calm for hundreds of years. 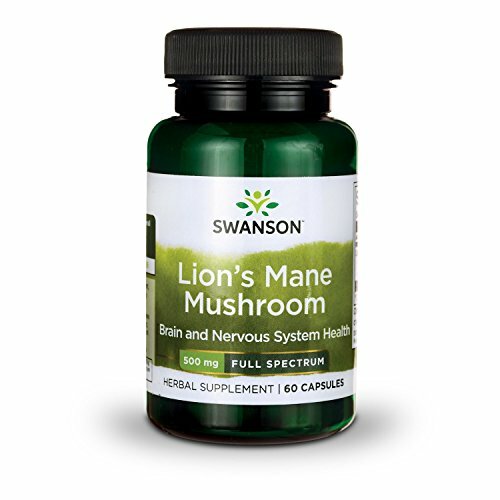 WORLDWIDE MENTAL PERFORMANCE ENHANCER - Lion's Mane mushroom supports brain power and mental focus by boosting antioxidant activity in tissues, defending against cell degeneration within the brain, and promoting nerve growth, which may be a deterrent for a number of potential health concerns. 500MG CAPSULE FEATURES LION'S MANE MUSHROOM from MYCELLIUM BIOMASS - Our lion's mane is from Hericium erinaceus (Mycelium biomass), an edible mushroom found in North America, Europe and Asia, and used traditionally for centuries to support cognitive health, mood and a healthy stress response. OUR QUALITY & HERITAGE COMMITMENT - We're control freak...in a good way! For nearly 50 years, Swanson Health has delivered science-backed health and wellness products to people around the world. In 1969 in Fargo, ND, Swanson began with a mission to offer pure and potent health and wellness solutions that help people live simply healthier together. Our facilities are Good Manufacturing Practices (GMP) certified, and we voluntarily participate in third-party, independent laboratory testing.